The tender hatchling is embracing other two eggs as if waiting for its siblings! As you already know by now that my washroom has been converted to a makeshift Bulbul maternity ward (Click to read the First and Second post of this Bulbul series), I'm delighted to present before you the first bulbul hatchling which has finally come out of its shell! Before expressing my unbound joy further, I need to justify my stand on photo blogging of this series, as some of my social networking friends have raised objections against clicking photos of a hatching bird. I respect their concern for the hatching bird and also their strict adherence to the etiquette of bird photography. I too enjoy being human and I do value lives (of course, except when I'm munching crispy chicken pieces). In this case the bulbul nested in my washroom and in no circumstances I could have abandoned that place. It is not even a roomy washroom, so, my routine movements during bathing, peeing and pooping used to scare the hatching lady in the beginning. Both of us had no choice but to get used to with each other's presence. Although I enjoy shooting with my cameras, never took them out in this case. Rather I kept recording daily events with my phone cameras which won't intimidate the bulbul or pose a physical threat to her nest. 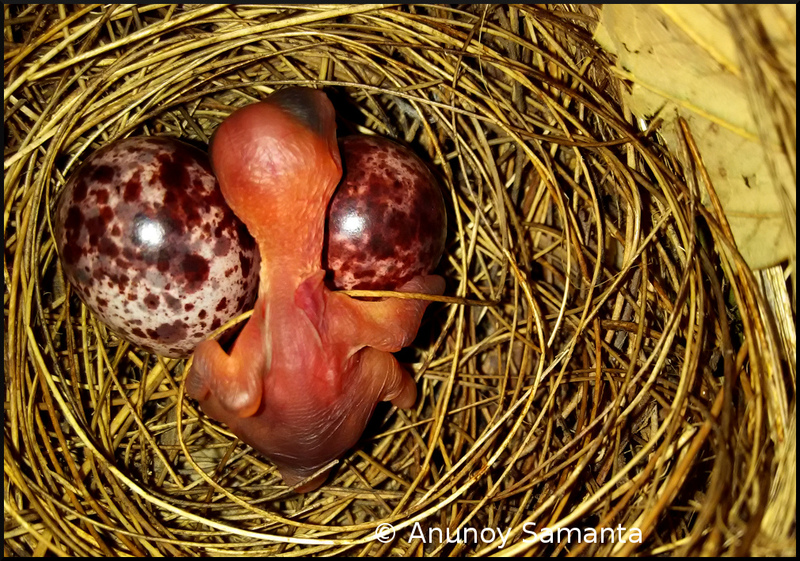 Previous egg photos and today's bulbul hatchling photos were taken utmost carefully from the top of the nest with my mobile phone when the mother bulbul was away. I see this documentation somewhat like video recording of operations which surgeons do nowadays. 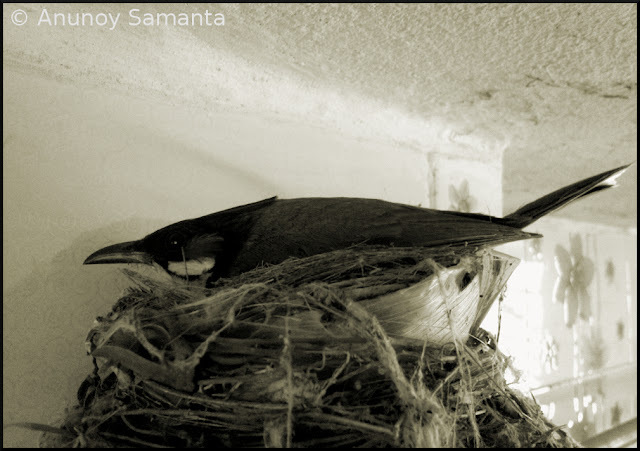 Ah, enough talked, it is time to celebrate the first successful outcome of the bulbul's hatching in my bathroom. As of now, the hatchling looks too tender and unprepared to survive on its own. Definitely its mother is nursing it untiringly and she'll ensure that her kid survives in this nasty world. Do not forget to bless the tender bulbul hatchling most generously. I'll try to record its development along with fates of remaining two eggs in my subsequent photo posts. Mother bulbul is always on guard even though she doesn't mind my presence. Looks like a toy, hope it survives...looks so weak to me.